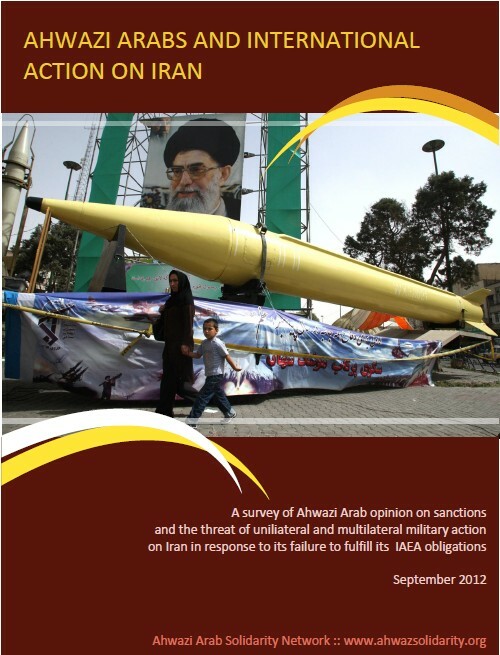 The international community should consider multilateral military action to remove the Iranian regime, say Ahwazi Arab opposition groups in a survey of opinion conducted by the Ahwazi Arab Solidarity Network (AASN). The survey of leading Ahwazi parties and activists found unanimous opposition to an Israeli strike on facilities related to the Iranian nuclear programme, but warned that sanctions will not be enough to encourage the regime to abide by its obligations under the Non-Proliferation Treaty (NPT) and in accordance with UN resolutions. Only multilateral military intervention aimed at overthrowing the oppressive, terrorist-sponsoring regime will prevent the acquisition of nuclear weapons, say the respondents who urged Western governments to work with them towards democratisation. The Ahwazi opposition is comprised of a number of disparate groups. Among those surveyed are the Ahwazi Democratic Popular Front (ADPF, a secessionist, secular socialist party), the Democratic Solidarity Party of Al-Ahwaz (DSPA, a federalist secular liberal party), the National Liberation Movement of Al-Ahwaz (NLMA, a secessionist party that advocates moderate Islam against what it sees as an extremist regime), the British Ahwazi Friendship Society (BAFS) advocacy group and leading intellectuals and opinion-formers within the Ahwazi Diaspora. These groups have different ideas about the future of Al-Ahwaz or Arabistan, an autonomous Arab region until 1925. The central differences within the Ahwazi movement are whether to seek an independent state or greater autonomy within Iran and whether or not to wage an armed struggle. The report remarks: "On the issue of the response to Iran’s nuclear programme, there are areas of consensus that the international community should heed. Living in an oil-rich region, the five-million strong impoverished and persecuted Ahwazi Arab minority will play a crucial role in regime change and they deserve to be heard." There is broad support among Ahwazi groups for the toughest possible sanctions regime against the Iran government, including sanctions that would effectively shut down the Iranian economy to foreign trade. Ahwazi groups are unanimous in their opinion that sanctions have no negative impact on the welfare of Ahwazi Arabs, who are already suffering long-standing economic and social marginalisaton. There is overwhelming support for the EU’s oil embargo, but also a belief that the international community should go further in using sanctions to penalize human rights abuse and facilitate democratic change. The NLMA calls for a toughening of the sanctions regime, including a naval blockade to prevent all oil exports in order to bankrupt the Iranian government and destroy its ability to oppress its own people, particularly non-Persian ethnic groups. Such sanctions would wreck Iran’s nuclear programme and undermine its support for international terrorism, says the group. In its list of demands, the NLMA effectively calls for a complete trade embargo with sanctions against any state trading with Iran. These sanctions should be backed up by military force, including a naval blockade of Iran’s sea ports and closure of all banking operations. BAFS criticizes the overwhelming emphasis on nuclear proliferation at the expense of human rights and good governance. It called for Western “investment” in Ahwazi Arab NGOs to build a stronger civil society that is better able to bring the regime to account. The DSPA states that it would support a full invasion of Iran aimed at regime change in order to overthrow the oppressor of Ahwazi Arabs. The NLMA emphasizes that a decisive and quick war against the regime would be achievable simply by usurping Iranian control of Al-Ahwaz, which contains most of its oil production and therefore its main source of revenue. It believes that independence for Al-Ahwaz would establish peace in the Middle East and worldwide. BAFS warns that military action comes with significant risks that should be thoroughly assessed along with careful planning of post-war scenarios. It points to the years of chaos following the invasion of Iraq due to an overly optimistic belief that a stable democratic system could be created from nothing and would be immune from corruption, terrorism and foreign intrigue. Says BAFS: “Any risk assessment needs to be conducted with the involvement of a diversity of civil society groups in Iran. As they live in the most oil-rich and geopolitically sensitive area of Iran, Ahwazi Arabs should be central to any consultation over strategic military planning, particularly if action is aimed at regime change.